Apartment Gelsomino is situated in a rustic agriturismo at an altitude of 700 metres with a breathtaking view of the Val di Chiana. In total, there are 3 guest apartments. The house is surrounded by centuries old oak and chestnut trees. From Castiglion Fiorentino a road through the mountains will take you up to the agriturismo. It's a spectacular tour that's definitely worth taking. The last kilometre is an unpaved road. The agriturismo's rustic house used to belong to the Benedictine monks. Afterwards it was bought by a count. Then it remained vacant for 25 years until the current owner bought it to turn it into an agriturismo. 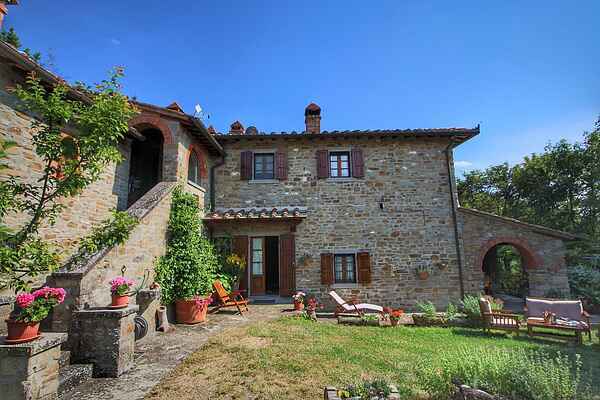 With great passion, the house was restored into an agriturismo. Apartment Gelsomino is attractively furnished with wood beamed ceiling and terracotta floors. The agriturismo has several animals including chickens, geese, goats, ducks, a horse and a donkey. Children love going to see the animals. The area makes for beautiful walking and cycling trips. If requested, the owner of the house can provide typical, regional dinners for an additional fee. Olive oil and wine tastings can be arranged at the agriturismo upon request.